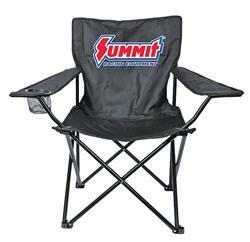 Take a load off and relax in one of our Summit Racing® folding chairs. Great for taking to the track, sporting events, picnics, and back yard chilling, these great chairs feature the Summit® logo and have a built-in cup holder for your beverages! Notes: Chair has a 350 lb. weight limit.